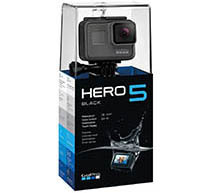 Carroll County Public Library offers two GoPro Hero 5 cameras and an accessory kit for check out to customers. The kit is available to any Carroll County Public Library cardholder, age 18 and older, with an account in good standing. The GoPro Kit contains the Go Pro Hero 5 camera, a Go Pro thumbscrew and mounting case, a USB charging cord and an adjustable chest strap. Borrowers must provide their own SD memory card and there are SD cards available for purchase at the branch libraries for $15. The loan period is 3 weeks with no renewals. The kits are housed at the Mt. Airy Branch but can be requested through the catalog. Check availability in our catalog. 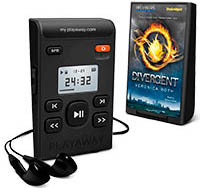 Playaway is the simplest way to listen to an audiobook on the go. With the audio already contained within, and a battery to make it play, there's nothing left to do but plug in earphones and enjoy. As the first self-playing audiobook, Playaway brings pages to life at the push of a button. Audio content and simple, digital technology are merged into an easy-to-use, self-contained player. And weighing only two ounces, Playaway is small enough to fit in the palm of your hand and goes anywhere you do! Playaways have a universal headphone jack that can be used with a number of accessories including headphones, earbuds, portable speakers, FM transmitters, and audio cables for playback in virtually any environment. Playaway Launchpads are secure, pre-loaded learning tablets designed for children and available for check-out at all CCPL branches. Get free access to high quality, ad-free learning apps grouped by subject area, grade level, theme and age. Each Launchpad features 10 or more learning apps. 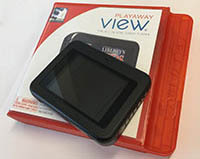 Playaway Views are all-in-one video players that make popular content for children accessible in a simple, portable and durable format. Each player comes pre-loaded with multiple videos featuring digital movies, shows, educational programming and more without the need for DVDs, downloads or an additional player. Children will enjoy access to Sesame Street, Clifford, Arthur, Berenstain Bears and more. 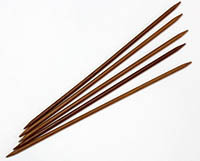 Knitting Needles now available for Check Out! Please check our catalog for availability. Circular Needles, Straight needles, and Double-pointed needles in sizes US 0 - US 15. Carroll County Public Library has a rubber stamp collection you can check out! Please check our catalog for availability. 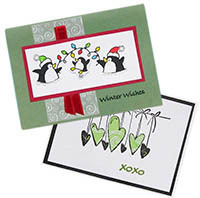 Stamp kits check out for 3 weeks and can be requested through the catalog like any other item. For ideas on how to use the stamps, check out our Pinterest! 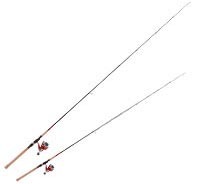 You can now borrow a fishing pole from the library! The Carroll County Public Library is pleased to offer this service to its customers, courtesy of the Maryland Department of Natural Resources. The poles will be housed at the Westminster branch, but may be placed on hold through the Catalog and borrowed from, or returned to any branch. It is the customer’s responsibility to obtain fishing licenses if needed and follow fishing regulations. Our Agreement Form which includes information about fishing licenses and regulations must be signed at the time of borrowing. The Carroll County Times Archive is a collection of digitally scanned microfilms of Carroll County Times newspapers spanning from 1911 to 2015 and is updated annually. There is a basic search function that allows users to retrieve certain issues by inputting keywords, dates, or a combination of both. 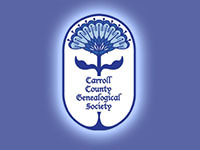 The Westminster Branch Library houses the collection of the Carroll County Genealogical Society, which includes vital records, cemetery records, and family histories. The collection is available for in-house use during normal library hours. The Community Directory is a gathering of information on a variety of non-profits and community organizations in Carroll County and the surrounding region. Resources include governmental agencies, recreational opportunities, clubs and organizations, day care centers, and religious services.